Crazy in Suburbia: Should high schools do away with football and other sports? Should high schools do away with football and other sports? Last Friday afternoon, I was sitting in the bleachers at Las Lomas High School, watching the Knights junior varsity team putting up a valiant struggle against the Acalanes Dons. It was a lovely, early October afternoon, T-shirt weather giving way to fall crispness as the sun went down and the stadium lights turned on. That I even just wrote this sort of Friday Night Lights, American sports-speak paragraph feels a little strange to me because I never much cared about football--not until my son started playing as a freshman last year. I certainly didn't care about football when I was in high school, and my team was the Acalanes Dons. I don't think I ever went to a Dons football game, and I didn't know any football players. As a member of the school's drama program, my friends and I considered ourselves to be something of what passed as the cosmopolitan elite in a suburban high school. Yeah, we were a bit full of ourselves. We joked about the jocks being too mainstream, and we stereotyped them as simple, "bust-heads" guys. We probably resented any primacy their team membership afforded them on campus, the fact that we had to attend pep rallies for homecoming, or the expectation that we get rah-rah about some vague notion of "team spirit." 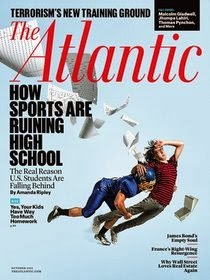 I have a feeling this anti-football, anti-sports sensibility would have found much to like about The Atlantic's big new cover story, The Case Against High School Sports. ... Even in eighth grade, American kids spend more than twice the time Korean kids spend playing sports, according to a 2010 study published in the Journal of Advanced Academics. In countries with more-holistic, less hard-driving education systems than Korea’s, like Finland and Germany, many kids play club sports in their local towns—outside of school. Most schools do not staff, manage, transport, insure, or glorify sports teams, because, well, why would they? But I'm not in high school anymore, and my son plays high school football and is really enjoying it. I really enjoy going to his games. I read this kind of story, and I find my mind grousing, almost like some Fox TV news fan, about more media attacks against the great American institution of football. Actually, I do seriously wonder if those arguments about American high school students falling behind their counterparts in other countries is a bit overplayed, tired--and simplistic. For one thing, can you really compare the academic achievements of students from the much more culturally and economically homogenous population samples that you would get from Korea, Finland and Germany against the United States, where students come from hugely diverse segments of society? OK, for me to attempt to make the argument that these educational hand-wringers are comparing apples and oranges, I would need to dig into the data. But from reading the article, Ripley doesn't demonstrate she did much digging into the usual data either -- which is disappointing, considering this is The Atlantic and I expect its writers to produce better evidence. Meanwhile, she seems to measure the "success" of American students by test scores and in terms of their potential as producers in an economy. In her argument, where do other indicators of success come in? I'm talking about students growing into adults who feel well-rounded and happy and contribute to society in other ways. Those sorts of attributes don't show up in standardized test scores. OK, so what if it's familiar argument, if it's true for a lot of kids? When my son said he wanted to do freshman football and start practicing the summer before freshman year, I was happy. It meant he wanted to somehow get involved in school and have in place a social network before the academic year started. He's become friends with the guys on both the football and wrestling teams. Being on both teams has given him confidence, a sense of belonging and an investment in the school community -- which I believe makes him much more engaged academically. But sports wasn't the only way he-- or any other student -- could find this sense of engagement. He could have found it, like I did, doing drama. Or, like other friends of his, who write for the yearbook or play in the band. Ripley's strongest arguments come when she picks apart the huge financial investment -- which often come in the form of hidden costs -- that schools make in their sports programs. She tells the story of a Texas rural school district, whose superintendent made an absolutely radical decision, especially in the spiritual home of Friday Night Lights. He decided to eliminate the high school's sports programs and focus on academics. The district faced being shut down by the state due to academic failure and financial mismanagement. Football at the high school cost about $1,300 a player; math, by contrast, just $618 a student. I've watched -- and loved -- Friday Night Lights. Certainly enough to know that there are places in America where sports truly overwhelms the culture of the schools and of the surrounding communities. I would have suffocated in a Dillon Panthers kind of school, and I'm sure there are a fair number of kids in those high schools who suffer because they don't care about being part of football-dominated school spirit. Ripley's arguments probably better apply to the Friday Night Lights kinds of places. Meanwhile, she has these curious paragraphs and bits of information near the end of the her article that undercut her arguments. Though the research on student athletes is mixed, it generally suggests that sports do more good [italics mine] than harm for the players themselves. One 2010 study by Betsey Stevenson, then at the University of Pennsylvania, found that, in a given state, increases in the number of girls playing high-school sports have historically generated higher college-attendance and employment rates among women. ... found that teenagers who participated in extracurriculars had higher college-graduation and voting rates, even after controlling for ethnicity, parental education, and other factors. So, here in suburban San Francisco, we're blessed with pretty good to outstanding public high schools that usually offer a range extracurricular activities. I'm sure there are some kids at Las Lomas who just want to focus on academics -- and they can. If Las Lomas is anything like Acalanes was when I was a student, then you can, if you choose, mostly tune out the sports culture -- with the exception of the occasional pep rallies. And then there are some kids who don't like school, or don't thrive in your typical, large American comprehensive high school. Maybe they are otherwise brilliant, or entrepreneurial, or self-starting, and they will find their own way to succeed in life. And when they become rich and successful CEOs, they will bemoan how mainstream public education dulls the mind and fails to help our next generation stay competitive in our global marketplace. They will send their kids to Waldorf schools, or whatever new alternative education trend comes along, and they will start their education foundations and donate to programs that support charter schools or small-school communities. Such efforts are laudable considering that there certainly are kids who would thrive in those kind of education environments. However, I would guess that a majority of students are relatively content with the blend of academics and extracurricular activities they get at larger comprehensive schools. They want the opportunity to have something besides academics to engage them creatively, socially, physically or intellectually. As it happens, some kids will find that sense of engagement in the swimming pool, on the basketball court or on the football field. Ask the kids in Korea, Finland and Germany if they'd like to attend high school in the US. Until someone can demonstrate that these kids are actually learning anything in school, I say let 'em play football. The risk of brain damage on the field has to be less than in the classroom.